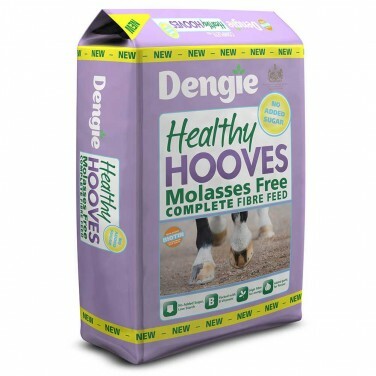 Dengie Healthy Hooves is the nutritionally complete, low calorie fibre feed for horses and ponies prone to laminitis and those with hoof problems. Healthy Tummy contains the latest ingredients to promote gut health including alfalfa, herbs and Protexin Formula. 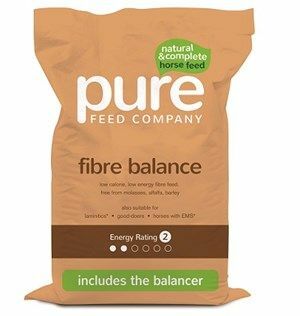 A high specification of vitamins and minerals are included to create a high calorie complete fibre feed. Mollichaff Calmer is a complete fibre feed that is ideal for nervous or excitable horses. It has elevated levels of magnesium, as well as chamomile, lemon balm and mint. Mollichaff Condition is a highly digestible, high fibre, high oil and low starch blend which can be fed as a complete concentrate feed alongside good quality forage. 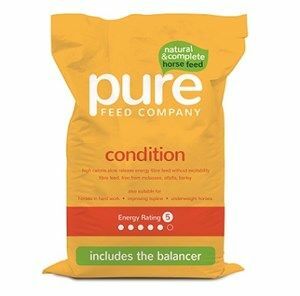 A complete fibre-based concentrate feed designed for the nutritional support of horses and ponies prone to laminitis. 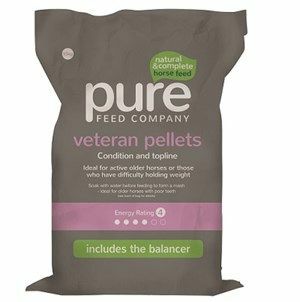 Pure Feed Company Pure Condition is a fibre based feed designed with oil as the main energy source. This provides your horse with calm calories as it releases energy slowly into the body. 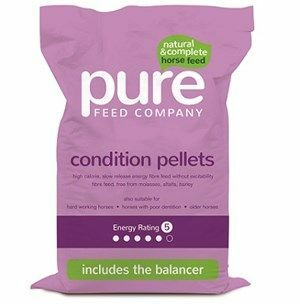 Pure Feed Company Pure Condition Pellets are designed to improve the condition of fussy horses without making them excitable. 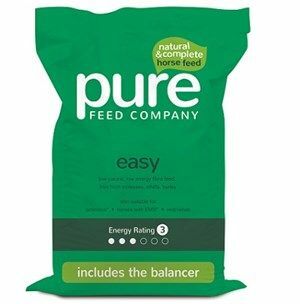 Pure Feed Company Pure Easy provides slow-release energy for horses in work, but is low calorie so doesn’t encourage weight gain. 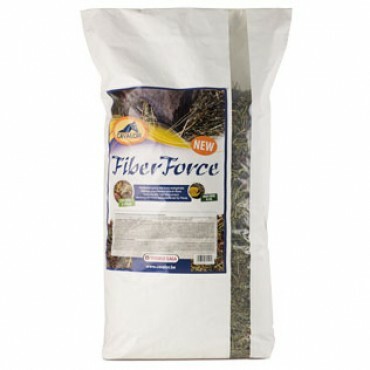 It is high in fibre which promotes good hind gut health. 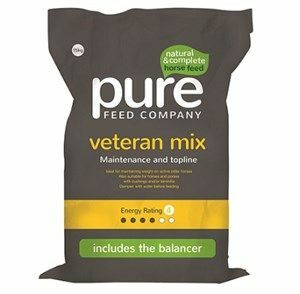 Pure Feed Company Pure Veteran Mix is formulated for senior horses that need extra help maintaining condition or are still in regular work. 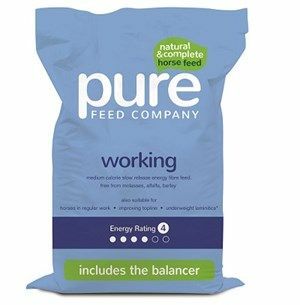 Pure Feed Company Pure Working is ideally formulated for horses in regular work such as taking part in riding club activities and competing. Simple System Simply Complete is a super convenient feed that combines a whole host of high quality forages and complementary ingredients like linseed meal and beet pulp. Simple System Top Nosh Top Up Feed is a blend of highly nutritious, natural ingredients for a convenient, nutrient rich, top up feed or balancer. 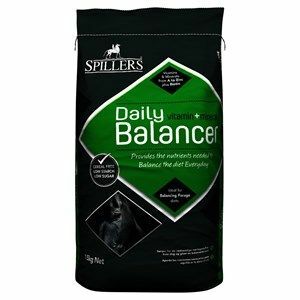 Spillers Daily Balancer has been formulated to provide all of the vitamins and minerals needed to balance out a forage only diet. 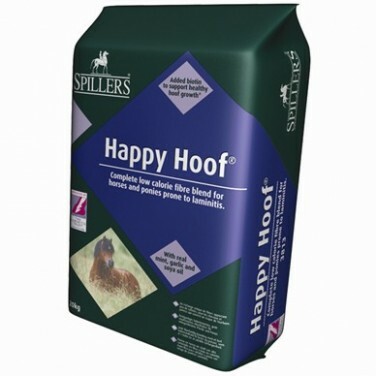 Spillers Happy Hoof is a low sugar, low starch, high fibre feed that is enriched with vitamins and minerals and includes biotin and key antioxidants. 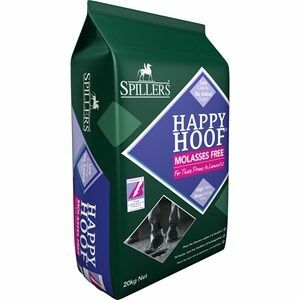 Spillers Happy Hoof Molasses Free is a unique low calorie fibre blend that is ideal for those owners concerned about the inclusion of molasses in their horses feed. Equilibrium Condition has been scientifically proven to improve the condition of your horse safely and support muscle function. It also promotes positive behaviour and maximises digestive health. Equilibrium Growth is a formula that not only supports sound bone development but also promotes positive behaviour. It supports your horse's immune defences and improves his digestive health system. Equilibrium Low Energy helps to maximise your horse's digestive health and has a low glycaemic response and is suitable for horses and ponies prone to laminitis.